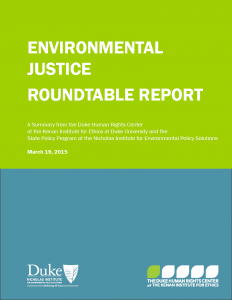 This report summarizes discussion from a roundtable including faculty from Duke University, the University of North Carolina at Chapel Hill, and North Carolina State University as well as research staff at the universities and Research Triangle Institute. The participants represented a variety of disciplines including geography, design, urban planning, economics, sociology, political science, philosophy, law, and environmental science. 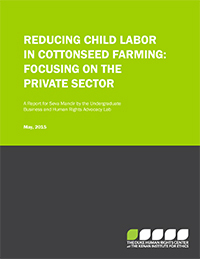 This report discusses interventions used to address child labor in agricultural production. Its primary focus is on the private sector. The report was written by undergraduate students in Duke University’s “Business and Human Rights Advocacy Lab” class (spring 2015), for Seva Mandir. 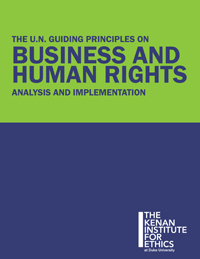 In September 2014, as part of the “Conversation in Human Rights” series, the Duke Human Rights Center at the Kenan Institute for Ethics hosted a discussion on the evolving obligations of businesses to respect human rights. Panelists included Dr. Puvan Selvanathan (Member of the UN Working Group on Business and Human Rights and Head of Food and Agriculture at the U.N. 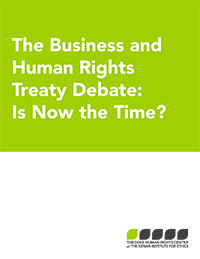 Global Compact), and one of the central questions of the conversation was whether the United Nations should move forward with a proposed treaty on transnational business and human rights, or whether it should focus on implementing the current Guiding Principles. This submission by Dr. Selvanathan shares the view he offered at the Kenan Institute on the treaty debate. It is his personal opinion and does not reflect the position of the UN Working Group on Business and Human Rights or the Global Compact. A second installment will be published in January 2015. Download the opinion piece (PDF). On October 20, 2014, the Duke Human Rights Center at the Kenan Institute for Ethics hosted a roundtable on human trafficking. The roundtable included the Kenan Institute’s annual visiting human rights fellow, Dr. Anne Gallagher, as well as faculty from a broad range of disciplines from across Duke and other universities. The primary goal of the roundtable was to facilitate an interdisciplinary conversation on human trafficking and to provide an opportunity for participants to share their work as well as to learn about ongoing research outside their academic fields. The summary is not intended to be a document endorsed by consensus of the group nor to be taken as reflecting the positions of individual participants. The Bass Connections/Humanities Writ Large project “Language of Genocide and Human Rights” is examining the use of the word “genocide” from its inception in the 1940s to the present. Project members are attempting to map both the usage and development of the term in human rights discourse and how it has functioned in international political developments since World War II. 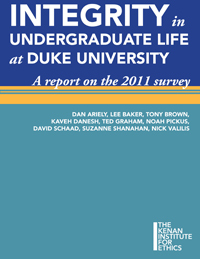 The project consists of an interdisciplinary team of Duke undergraduates, graduates, faculty members, and researchers. 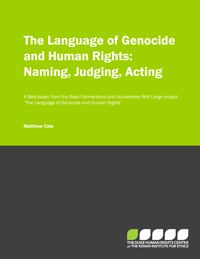 In October the project group met to discuss Political Science Ph.D. student Matthew Cole’s paper, “The Language of Genocide and Human Rights: Naming, Judging, Acting.” In it he summarizes the current state of the field on genocide language research. 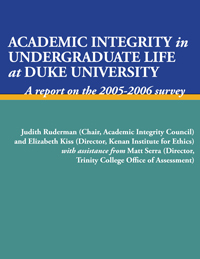 In spring 2011, the Academic Integrity Council and the Kenan Institute for Ethics surveyed 2,000 Duke undergraduates about integrity inside and outside the classroom and conducted in-depth interviews with graduating seniors. The survey and interviews document marked reductions in academic dishonesty; significant gaps between the large numbers of students perceived to be cheating vs. the smaller number of students self-reporting cheating; and rising numbers of students reporting inappropriate collaboration. 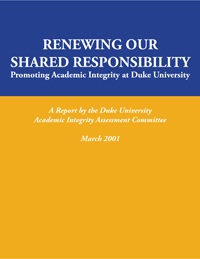 The survey and interviews also explored the relationships among integrity in different domains (academic, social, work, and civic) and raised key questions about how a Duke education can and should affect multiple dimensions of a student’s sense of integrity. How can the language and architecture of the human rights regime apply to companies, when it was created as a state-based system? What is the balance between focusing on processes versus outcomes in assessing the performance of both states and companies? How should all organizations in this domain–from companies with competing priorities, to resource-challenged NGOs, to the U.N. Working Group–best focus their limited time and capacity? The Brookings-Duke Immigration Policy Roundtable, a joint project of The Brookings Institution and the Kenan Institute for Ethics, was created to surface and address the implicit trade-offs and assumptions underlying the current immigration debate and generate policy recommendations that better reflect the wide range of views that Americans hold toward immigration. 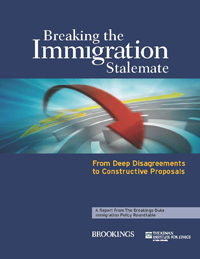 “Breaking the Immigration Stalemate: From Deep Disagreements to Constructive Proposals” reflects the collaborative effort of this unique group–including think tank analysts, political and policy entrepreneurs, community leaders, former government officials, and academics from various disciplines.